On one level, this is probably the most inappropriately titled post I’ve written. 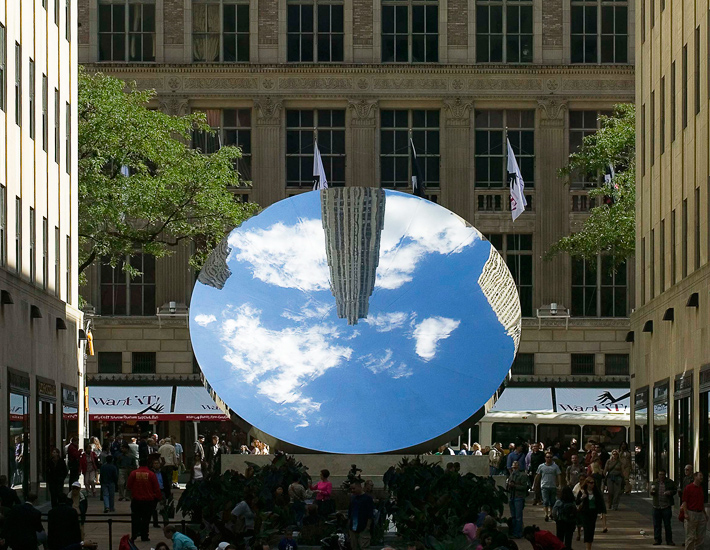 Anish Kapoor’s work is, in my view at least, usually very far from down to earth. 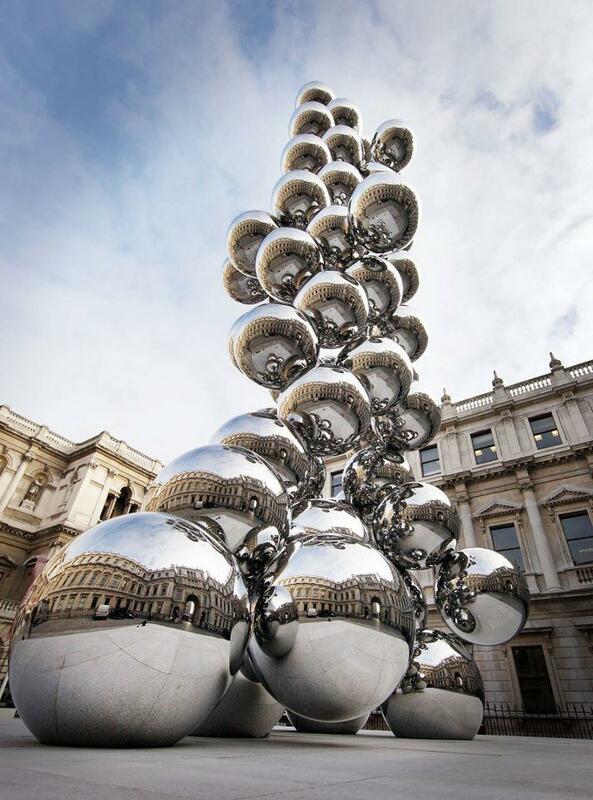 At its best, Kapoor’s work is extraordinary; it can redefine the space it occupies and disorientate, baffle and sometimes entertain its viewers. But – with the notable exception of the quietly beautiful, and easily overlooked, pregnant wall pieces – subtle it ain’t. Pompous, yes. Excessive, certainly. Subtle, not so much. 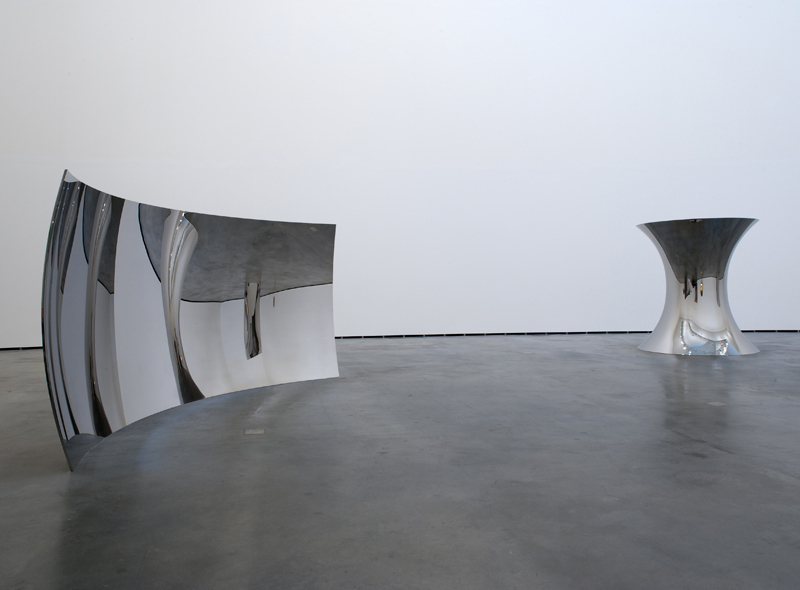 To start with the entertaining, by bringing strangely distorting mirrored surfaces into the gallery space, Kapoor entices his audience to pose and play. This is art crossed with the funfair in the form of the hall of mirrors and it’s hard not to be beguiled by the result. Moving backwards and forwards before the mirrors, we might get fatter and thinner or be turned upside down. The results aren’t exactly profound but they are both beautiful and good fun. 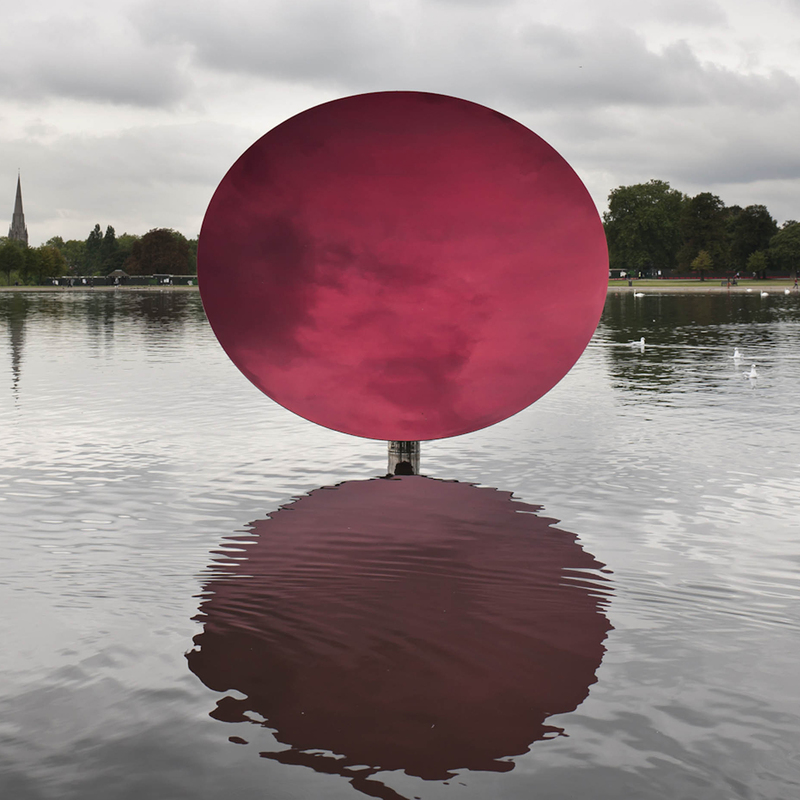 In 2009, Anish Kapoor was the first living artist to be given a solo show at the Royal Academy in London. The reviews were good, the queues were long, everyone who went seemed to love the exhibition and I liked Kapoor’s work so naturally I went along. And hated it. I still clearly remember loving Kapoor’s 1998 show at the Hayward Gallery, and I liked most other things I’d seen by him (although I remain somewhat abivalent about Marsyas, his 2002 work for the Turbine Hall), so what had changed? I saw the Kapoor show again at the Guggenheim in Bilbao – I know, I know, I went back for more, but hey, I was in Bilbao, it was on and I wanted to see the building and other things inside it – and had much the same response. And once again Tall Tree and the Eye – very different in such a different setting – was stunning. It was the actual exhibition that changed my view of Kapoor’s work though, particularly the two big set pieces – a cannon firing red wax and paint cannonballs and a train carrying a block of similar material (this work took a different form in Bilbao), the works others had seemed most excited by – which to me seemed overblown. My main gripe – with the train especially – was that red paint had been smeared in places it couldn’t have reached unaided. The work needed simplicity; it didn’t get it. 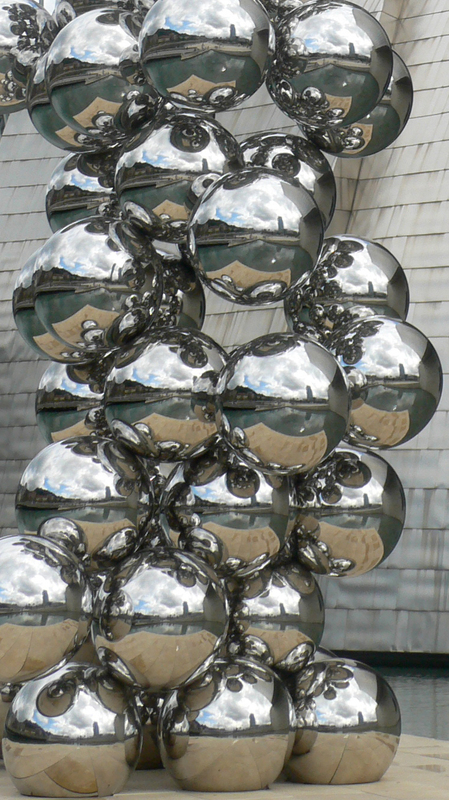 Kapoor’s Sky Mirrors which have been shown in different places and in different sizes for a good while now (one was installed at Nottingham Playhouse in 2001, but the commissioning process had started in 1995), are large convex mirrors that turn their surroundings upside down, in much the same way as some of the gallery works do. When installed outside this has the effect of bringing the sky down to ground level, meaning that the works are particularly fascinating situated within the built environment. 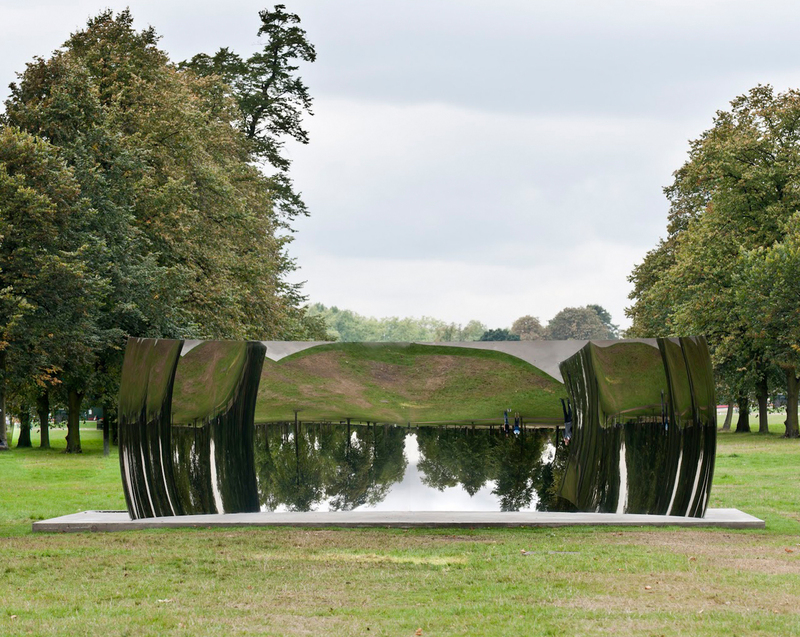 In Autumn 2010, a number of mirror works by Kapoor were exhibited in Kensington Gardens. As in the built environment, the works are good in this parkland setting too. Why then, despite loving these pieces in photographs and living in London, did I not quite get round to visiting them during their six month stint in the park? Well, I did have good intentions and I almost certainly visited the Serpentine Gallery – also in Kensington Gardens – during that period, but I just didn’t quite make it. All in all it comes down to that show at the Royal Academy and the fact that I still resent Kapoor slightly for that couple of hours of my life that I can’t get back. 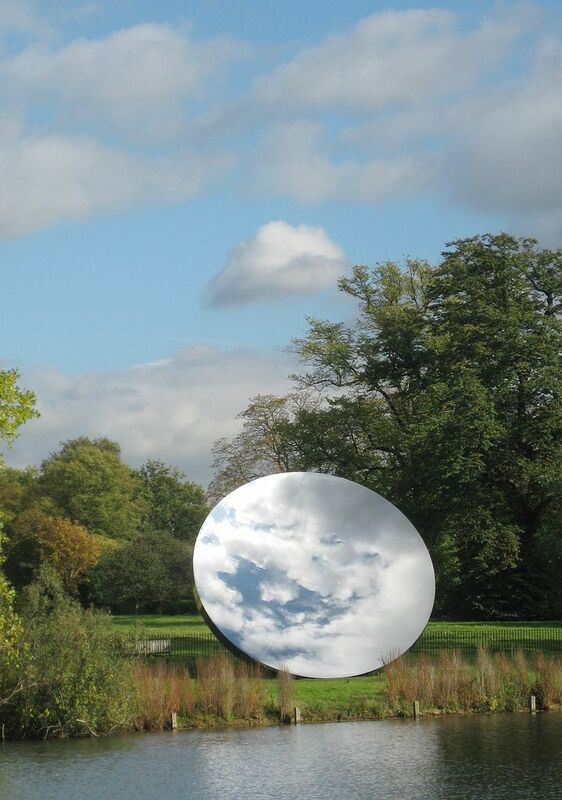 This entry was posted in Installation, Public Art, Sculpture and tagged Anish Kapoor, art, C-Curve, mirrors, sculpture, Sky Mirror, Tall Tree and the Eye by Ann Jones. Bookmark the permalink. I haven’t seen his work IRL (out here in the colonies again:) but I have loved the powdery stuff. The last red one looks delish. Would have to see the others IRl to judge, although I agree it’s pompous for sure. Do you have pics of the “pregnant wall pieces”? The powdery pigment pieces are rather lovely, it’s true, although I prefer the wall-based pieces like this: http://qagoma.qld.gov.au/__data/assets/image/0009/59985/varieties/Popup_800.jpg to the little piles of pigment like these: http://blog.visitlondon.com/wp-content/uploads/2009/09/pigment_2.jpg (although the red one is gorgeous). 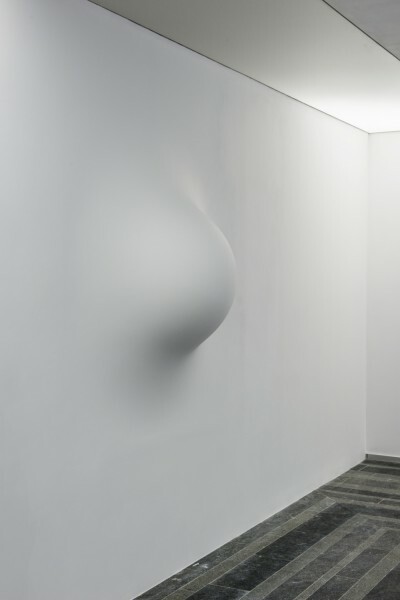 The pregnant wall thing is this: http://pinchukartcentre.org/imglib/_newimage/photo_and_video/photo/18082/18094/_il80073.jpg – it can be almost invisible unless you catch it at an angle. In the Royal Academy show it was in a rather crowded room with the small pigment works and lots of people seemed to be missing it. Thanks for those links Ann. The pregnant wall thing is arresting. Yes the bigger wall based piece is more sumptuos. Speaking of course from only having seen it as an image, not IRL.